Kesya, founded by Divya Shekhawat and Shivangani Singh, is a bespoke accessories brand, predominantly for men, that brings back the royal touch of Rajasthani craftsmanship. Buttons for men's suits, is what they do best. They even have a collection for ladies now. You're the groomsman for you buddy's wedding, and your suit looks all swish. But imagine it dotted with royal motifs on buttons, done up in gold. Adds that touch of nobility doesn't it. For that extra regal look, Kesya is the best place to look. Bridging the gap between old techniques and modern style, this brand offers sherwani, suit or kurta buttons, as well as cuff links. What we love most is that the hand painted motifs are reminiscent of the history of Rajasthan. So you'll see game birds that draw inspiration from colonial hunting sessions (think mallads and pheasants) to majestic elephants on black or cobalt blue. Mughal flowers, sunburst patterns, duke buttons and intricate onyx buttons that look right of a Mewar palace are their best-sellers. Add on quirky deco buttons in metal or Chevron-logo style lines, and you've got yourself statement accessories. Pair them with classy pocket squares they also have of offer, and you've got yourself a modern, dapper gentleman. For those extra particular lads, why no get Kesya to do a bespoke set of buttons for yourself? 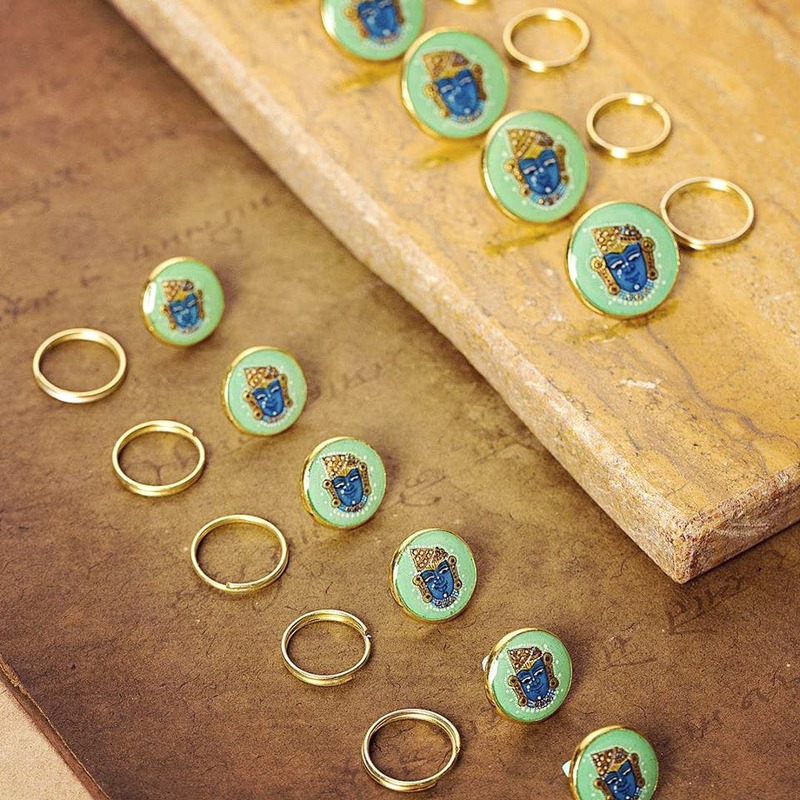 They will make you your family crest, initials or anything you fancy, really, and we're huge fans of that. Nothing like some quality customisation to make a style statement. If the Maharaja of Jaipur and the Prince Of Kashmir can have their own, then you should too! Ladies, they have a collection of necklaces, bracelets and earrings which have gorgeous flowers -- from intricate bougainvillea to simple lillies, for you too.